All transactions are safe and secure with a reliable history in online purchasing behind each of our associates. Buy the Scarface Logo shirt to own Scarface clothing and merchandise. The fronts of these black Scarface shirts display a silver version of the Scarface movie poster art. The design shows Tony Montana (Al Pacino) standing next to the movie's title, which is displayed vertically. Perfect for a night at the club, this short sleeve shirt is a stylish tribute to the fictional gangster. Order it with a Scarface action figure. 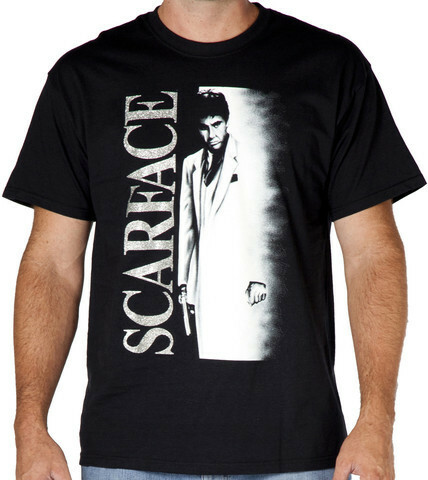 In addition to the Scarface Logo tee above, browse the Scarface Clothing Gallery for more apparel like men's and women's clothes, kids shirts or hoodies.